Houston, Texas, site of Super Bowl 51, will see a marked increase in tourists for the 2 weeks prior to the big game, taking place on February 5, 2017. This poses several security challenges that are always of concern to local authorities. 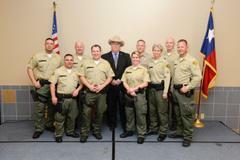 Thankfully, they have law enforcement partners to draw from all around the county. 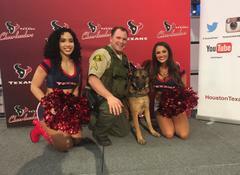 In this case, the Los Angeles County Sheriff’s Department Transit Policing Division is partnering with the Transportation Security Administration (TSA) and local authorities to provide Explosive Detection K9 teams to assist in securing transportation to and from the NFL’s Fan Experience and the actual Super Bowl game. 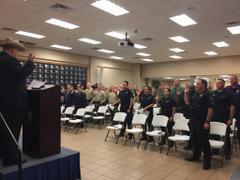 On January 24, 2017, eight TSA trained K9 teams, one K9 handler Sergeant, and a Team Lieutenant, all from LASD Transit, were sworn in as Deputy U.S. Marshal’s by U.S. Marshal in charge of the Southern District of Texas, Gary Blankenship. Approximately 51 other K9 teams from around the U.S., Puerto Rico, and Guam, were also sworn in to assist with law enforcement duties during the event. This is the third year that LASD Transit Policing K9’s have been asked to assist with securing the Super Bowl events that draw tens of thousands of fans from all over the globe. The Transit Policing Division of the Los Angeles County Sheriff’s Department contract policing responsibility for the Metropolitan Transportation Authority or Metro, and the Southern California Regional Rail Authority, or Metrolink. The eighteen K9 teams and two K9 Handler Sergeants, which make up the LASD Transit’s Explosives Detection K9 Unit are the second largest TSA trained K9 unit on the west coast. Sheriff’s Central Operations Bureau Lieutenant Richard Hoffman, who oversees the Division’s K9 Unit, knows the importance of participating in large scale events such as this one. 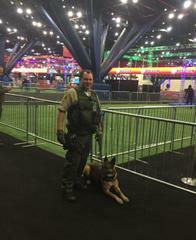 “Our K9 teams are constantly training and are used to crowds as large as those attending the Super Bowl. We are humbled to be asked to provide assistance, and grateful for the opportunity this affords our teams to put their skills into practice.” He went on to say that working with the U.S. Marshal’s Service and the TSA was a great partnership in providing state of the art detection regimens where they are needed most. The LASD Transit Policing K9 Teams will be policing with other law enforcement teams before, during, and after Super Bowl 51.